Hollywood studios just can't help themselves. The calendar still says April, but the first of the year's summer blockbusters is landing this weekend. With Fast Five, Universal is heavily pushing the "summer starts this weekend" angle, and while the calendar may not agree with them (whatever, there's still snow on the ground where I am), it'll certainly bring the first summer-like level of box office performance of the year. 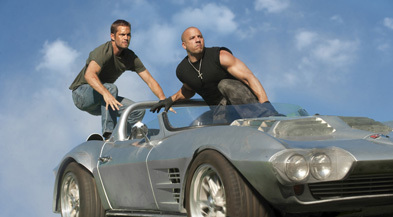 The Fast/Furious series is surprisingly ten years old now, and is essentially Vin Diesel's entire career. It's also had one of the strangest arcs of a franchise ever, with the first hitting big, the second film opening strongly but dropping heavily as one of the worst films ever, the third film, a spinoff, nearly destroying the franchise entirely, and the fourth bouncing back to become the most successful of all of them.